Working out of a truck can create roadblocks to healthy living. Typically, drivers don’t have set schedules, rely on truck stops for nourishment, and sit for long stretches of time. Over time, this could lead to various health problems, including weight gain, back pain, and lethargy. Here are five tips to help drivers maintain a healthy lifestyle on the road. COOK HEALTHY MEALS ON THE ROAD. Stock up on these staples to make a variety of meals right in your cab: organic produce, oils, seasonings, organic chicken and beef, wild caught salmon, quinoa, canned beans, and lentils. Meditating, taking deep breaths, and keeping a stress journal can help minimize the negative mental and physical effects of stress. FIT IN 30 MINUTES OF EXERCISE. Lower back and neck pain can be alleviated by simple stretching and moderate daily exercise. It could be as simple as taking a walk, or squeezing in a workout with the FIT System from the comfort of your cab. To get a good night’s sleep, avoid caffeine and spicy foods a few hours before bedtime, turn off electronics, and use a fan or white noise machine to drown out disruptive sounds. INVEST IN A COMFORTABLE CAB. The right truck can make all the difference in driver comfort. Look for these features: enhanced lighting, sun visors, oversized heated seats with upgraded suspension, tilting/telescoping steering wheels, automotive-style dash, noise-dampening insulation, and a plush mattress. 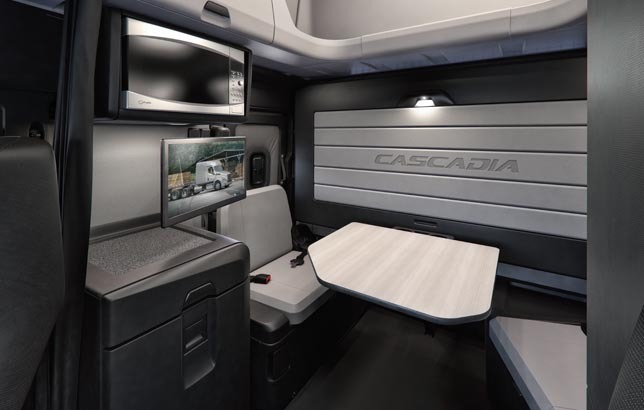 The new Freightliner Cascadia® comes standard with creature comforts like ambient LED lighting, a larger refrigerator with extra thick insulation to reduce power consumption, and a driver lounge with a dinette area and murphy-style bed. BUILD YOUR OWN NEW CASCADIA NOW!